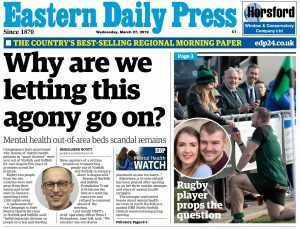 MENTAL HEALTH: An investigation by the EDP last autumn revealed that the Norfolk and Suffolk mental health trust had ordered a review into the reasons behind a spike in unexpected deaths in Norfolk after 20 patients in their care died during a five-month spell. 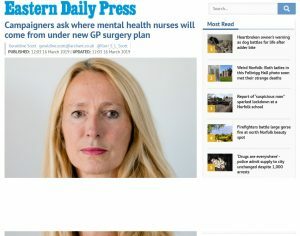 Yet GPs in charge of NHS purse strings have ruled out any significant increase in funding for mental health services. It is a shame that the Prime Minister couldn’t find the time to talk to six mental health nurses and campaign supporters from Early Intervention, Youth, CRHT, Inpatient, Forensic and NHSP who tried to raise urgent problems with him. Read more by clicking on the image above.